The Grey Dagger Moth and Caterpillar, Acronicta psi. 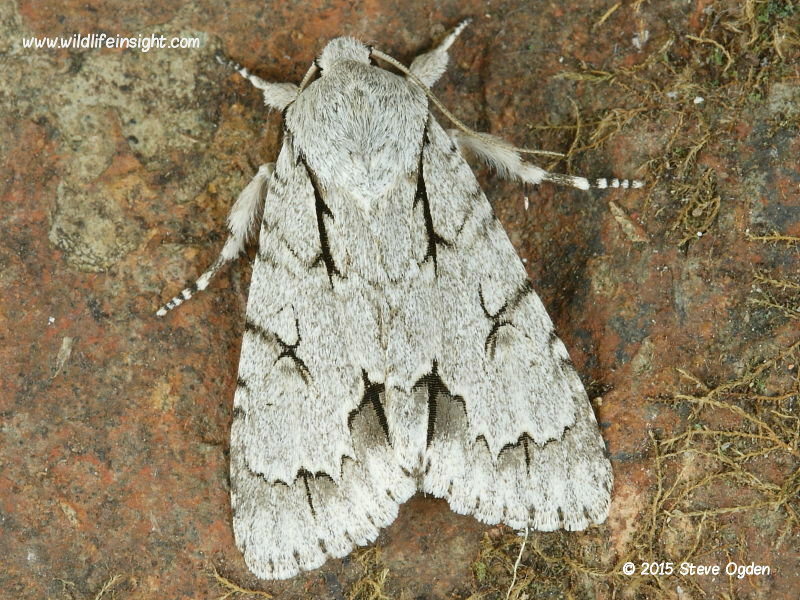 The Grey Dagger moth is a common species found throughout much of the British Isles and Europe. Without close examination the Grey Dagger, Acronicta psi is indistinguishable from the Dark Dagger, Acronicta tridens. Other common Dagger species include common species such as Dark Dagger, The Miller, The Sycamore, Poplar Grey, Alder Moth and The Knot Grass. Other caterpillars can be seen in the caterpillar galleries. In the British Isles the Grey Dagger moth flies mostly in a single generation between May and June but can have a partial second generation in the south. The caterpillars feed on a wide variety of deciduous trees including Oak, Hawthorn, Birch and Elm. The photographs shown are of broods reared from eggs laid by females attracted to light by John Foster on the Lizard, Cornwall. Those larvae featured above were reared on blackthorn and readily pupated on the underside of tree bark laid down on a thin bed of soil and leaf litter. The over wintering pupae were kept in a cool outhouse and brought inside during the Spring. Other commonly found ‘Dagger’ species (Acronictinae) in the British Isles and many parts of Europe include The Dark Dagger, The Alder Moth, The Sycamore, The Knot Grass, The Poplar Grey and The Miller.